Protect your privacy and prevent data leaks. So, you know how to look up app permissions before or after you install an app. That knowledge does not really help because you still need or want to use most of the apps on your device every now and then. The trade off between privacy, security and entertainment or productivity does not seem to be fair on Android. You either opt in for privacy and steer clear of privacy invasive apps like all the Angry Birds, Facebook and Google Maps that make your Android experience so much fun. Or, you use them all and pray you never have to worry about how much your sensitive information is leaking to a multitude of shady recipients. You have a third option, however. You can take more control over when your apps can and can not access the Internet, and with one of these apps you won’t even need to root your device. The following apps approach the task differently, so check out all of them and see which one you prefer. The point is you absolutely need to take control over how your apps use or abuse the permissions you grant them. While some of them, especially open source, explain why they need this or that permission, some of them are pretty liberal about how they manage your data in the background. For example, if you monitor your apps’ Internet access, you may be surprised to find out the app you use to hide your private photos is sending and receiving packets of data religiously. Why? One thing to note, though. Do not mess around with any app or service that has Google in its name. That is, unless you know what you’re blocking. Because if you block what you think might be a “spare wheel” in your cart, you might break some important things, so better don’t touch Google apps and services. Finally, do note that in order to provide the functionality, all these apps “create VPN” without actually creating VPN. Instead, all the traffic goes through the app once you allow it to establish a VPN, but no data is being sent to any servers. It’s just how the apps manage to provide that functionality in Android without root. Oh, and one last thing. If you use any traffic monitoring app, these apps will show as the most traffic hungry because they will now manage all your device’s traffic. Without further ado, here is a brief roundup of five Android apps that will help you manage how your apps and games access the Internet. Even though NoRoot Firewall is not the newest app on Google Play, it’s still number one destination for anyone looking to have the explicit breakdown of the apps’ activities regarding the Internet access. You may argue the UI and design are dated, but this is the case when functionality and efficiency outweigh the looks. Grant it the permission to create VPN, and see how the access requests pop up in your Notification bar. Its number one advantage that puts it ahead of the competition is how minimal this app’s permissions are – it does seem to be geared toward the privacy-minded audience. It does not access your phone number, nor location. What it does is present you with a fine-grained list of your apps, with the ability to allow or block the Internet access, or do nothing until prompted. You can create lists and filters based on IP address, domain name or host name. You can also deny or allow only specific connection of each app. Do note that all requests will be pending, and the corresponding apps won’t be granted access to the Internet, until you choose to Allow or Deny it. It only matters the first time you use the apps. After you have granted the permission, NoRoot Firewall will remember your decision. In case you wish to deny the access to a specific app you have previously approved, you need to go to the list of apps in NoRoot Firewall and uncheck the green check boxes. The UI is very easy to navigate and find your apps listed alphabetically. Whenever a previously un-processed app tries to access the Internet, you will receive a notification. Tap it to open the action window and see the list of the pending requests. You can also sort the permissions based on WiFi or data plan breakdown. You can also whitelist and blacklist the apps, and create global filters, which let you ban certain IPs and ports. Do note that a pre-filter will override any app-specific permissions. Another interesting feature of NoRoot Firewall is its access log, where you can see all connection attempts, complete with server IP address, host names, time, day, and whether the connection was denied or allowed. You can set the app to launch at boot. Its only drawback is that it’s a noticeable battery drainer for those devices that have the power issue. However, you can switch it on only when you enable the Internet instead of having it launch on boot. One other thing is that it does not work if you really need to connect to a VPN server because it will block your attempt. Another no root firewall app is Mobiwol, which is similar to the previous app in its functionality. The difference is in the app’s permissions, and Mobiwol requires more, including your location and identity. 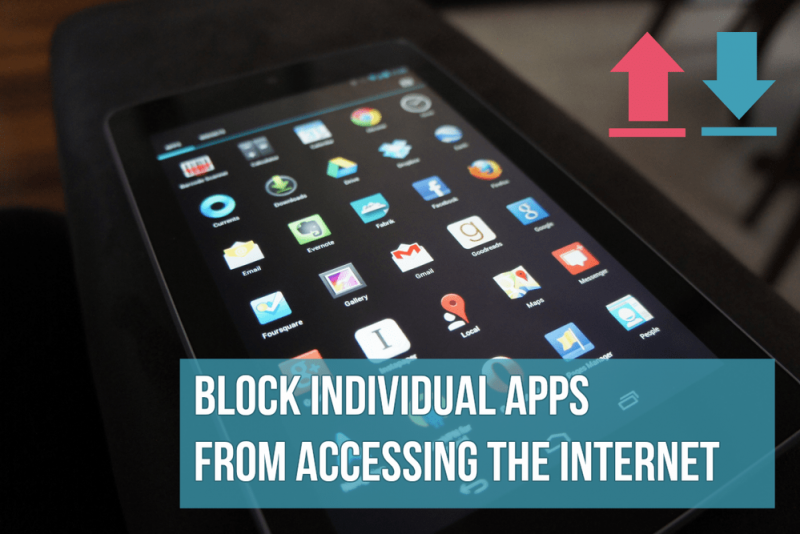 You can allow or block access to the Internet to individual apps on your Android with its help, block background activity and receive notifications when any app wants to go online. By default, the app launches at device boot. 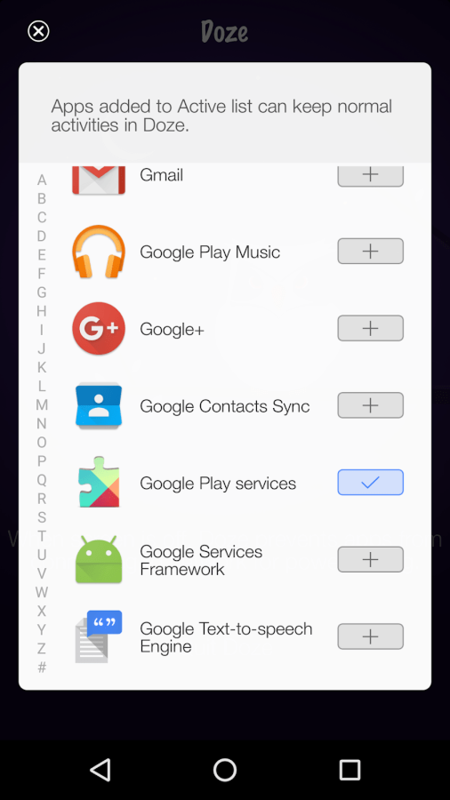 It identifies all apps installed on your device, as well as adds newly installed apps to its list, and lets you know when any of them request permission to access the Internet. It works similarly by creating the VPN, without actually creating one. Mobiwol also has an option to disable the background activity for certain apps and see the full data usage breakdown. However, do note that for some system-level apps the disabled background activity will restore in seconds. Since the app now manages all your traffic, it will show as the one with the highest usage on the list of traffic consumers. Mobiwol also lets you see data usage per each specific app. Opera Max is slated towards saving your data and giving you more control over how your apps consume WiFi, LTE, 3G, and 4G. It lets you do more than just block or allow individual apps, though. You can compress media files you send via browsers and apps. 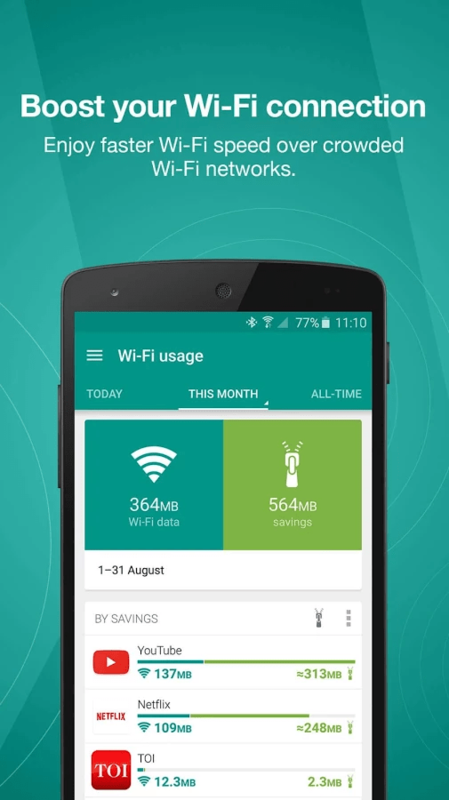 The app works as a WiFi manager that shows you which apps want the Internet access and work in the background. Additionally, Opera Max saves data when you stream music and video via YouTube, Netflix, Pandora and other popular streaming apps. The app also counts your mobile or data traffic, GB and MB wise on a per app basis. Needless to say it lets you block or allow individual apps from accessing the Internet, and running in the background. 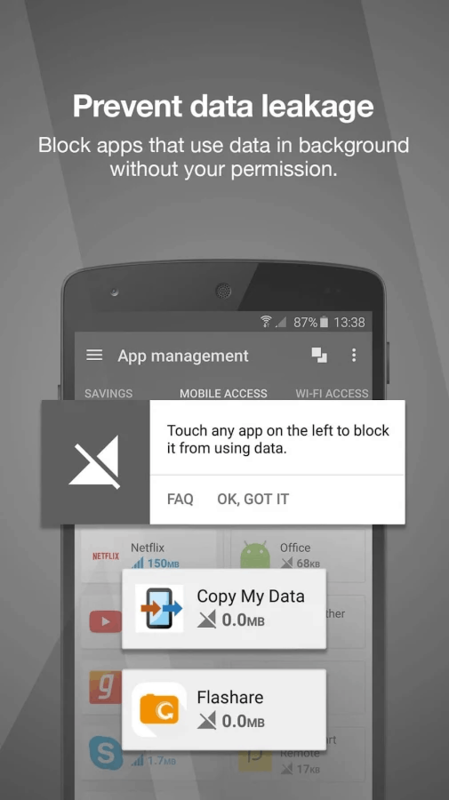 NetGuard does not require many app permissions itself. 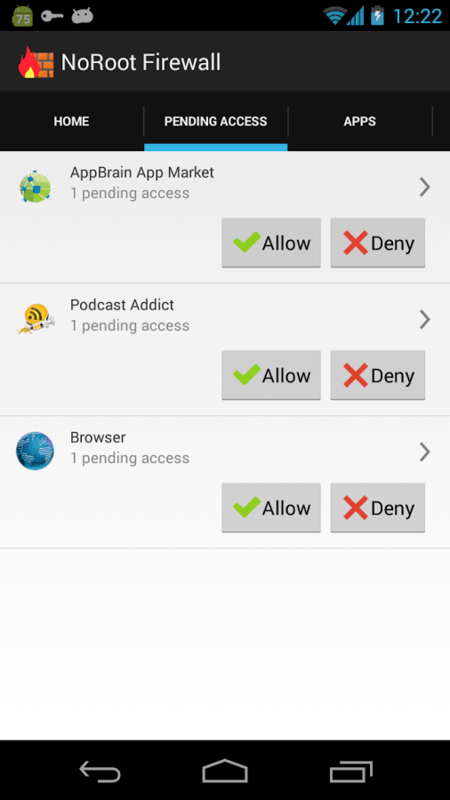 What it does is lets you block individual apps from accessing the Internet without root. 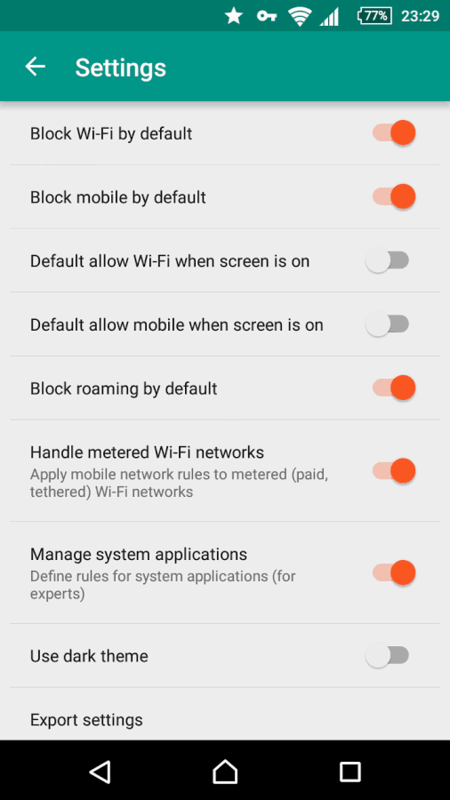 It also lets you manage WiFi and mobile connection app lists, so you can block certain apps on mobile connection and allow them on WiFi. It’s pretty straightforward in use, and open source, which means independent developers and reviewers can see its source code and pinpoint backdoors, bugs and flaws if they find it, so the developer can fix them. In other words, open source is good, mostly honest software. The app does not drain battery, does not display ads, or tracks your activity. It works with IPv4/IPv6 TCP/UDP. 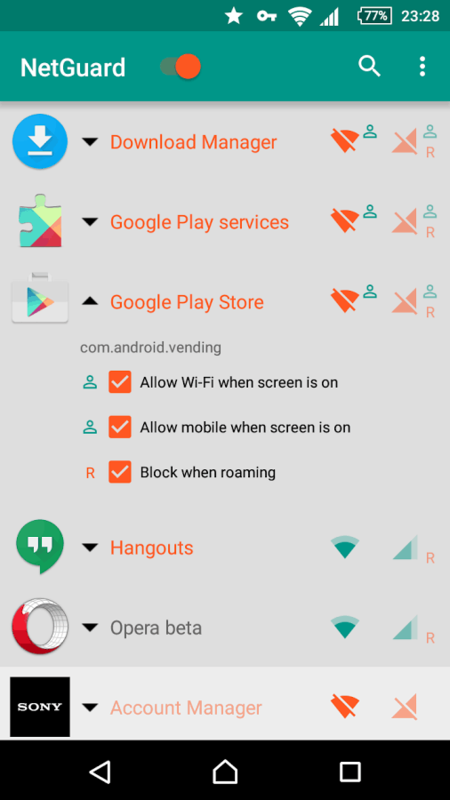 You can block system apps, or choose to block when roaming. Another nifty feature is you can allow certain apps to access the Internet while the screen is on, but block them when the screen is off. This is nice to disable stealth and nefarious background activity while the user is away. NetGuard does not have the Internet permission as such, hence you know it’s not sending your data anywhere. 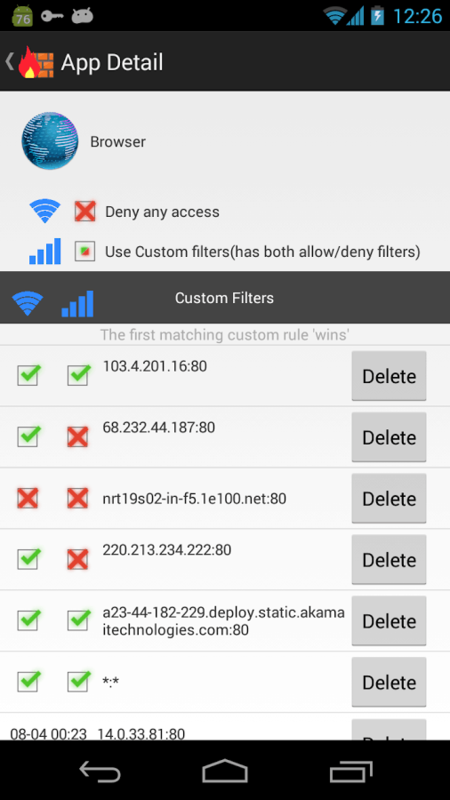 You can filter addresses and hosts, log traffic and fine-tune the app’s settings as you see fit. We already highlighted Doze on PocketMeta. Even though it’s positioned as the app that reduces your battery drain, it does so by blocking the apps from accessing the Internet while your device’s screen is Off. Sometimes, that’s all you need – block the apps from sending and receiving data in the background while you are not using your device, and see how this extends the battery life. 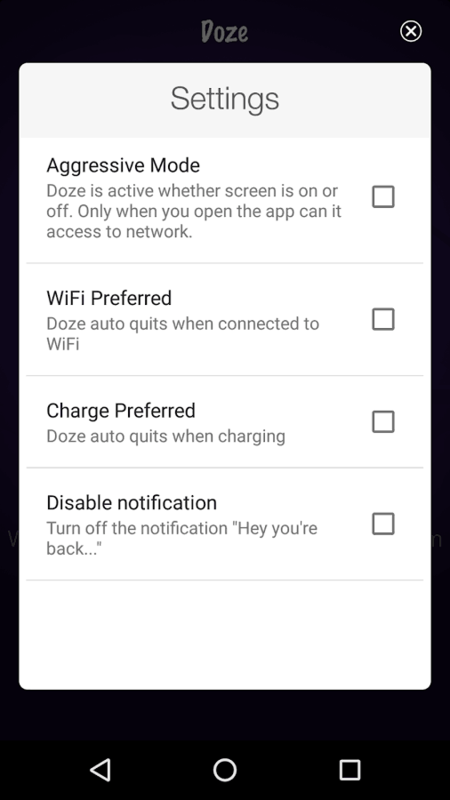 At the same time, Doze does not disable your WIFi or mobile connection, and you can allow access for individual apps from an easy-to-use list. For example, you only want WhatsApp, or any other messaging app, to have the access to the Internet while the screen is off. And you want all other apps blocked – no need to mingle with each app’s notifications individually. Just block them while you sleep, and know you will receive the WhatsApp notifications only. The rest will arrive when you turn on the screen. It does seem to add that extra juice to your battery. If you are on Lollipop and enable the power-saving mode, you should know it disables your data and only when you launch apps will they be able to have access. Likewise, Doze app is different from the doze feature in Android M, which triggers when your device in unplugged, is static for more than 30 minutes and has screen off. As you can see, the five apps are somewhat different in how they let you manage the apps’ access to the Internet, some with more, some with less features. So, see if you need that extended functionality for yourself, and let us know which app works best for you. Feel free to let us know if you find any other app suitable for the task in the comments below and don’t forget to like and follow PocketMeta Facebook, Twitter or Google+.